Sky Polaris » Blog Archive » Finally HOME! Around the world, over the poles. He has done it. The most difficult flight a small aircraft can make. An impossible journey. Michel will soon be HOME in Madrid, Spain after doing the impossible. The Sky Polaris project has many numbers. Numbers are required for the FAI World Record. Thousands of numbers make up the data for the collection of black carbon particles around the world. 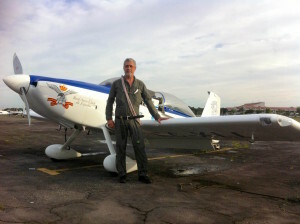 Captain Michel Gordillo touched 1000’s of lives on his way around the world. Some of those he met in person, but most have been vicariously riding along with him for these past eight months while viewing these pages. 76,400 – Kilometers flown for this project (please note that the Earth is “only” 40,000 km in circumference). 32,183 – Kilometers flown over open ocean. 305 – Tach hours sitting alone in the cockpit of the RV-8 flying, flying, flying. 1 – The number of aviators who have flown around the world over the poles in a small aircraft. ∞ – Infinite value to the aviation and scientific world. Michel has accomplished his dream, accomplished his goal, and has done what no other pilot has done before. Many experts told him it was impossible. Many government officials stood in his way and denied him permission. Many people said he was crazy, he would surely die. Many other people told him “Go achieve your dream.” And Michel Angel Gordillo has done just that. Captain Gordillo has accomplished so much but he did have help. Dozens of you donated your hard-earned money to help the project. Major sponsors, such as Acciona, Enaire, the Spanish Government, Spidertracks, and others have contributed time, money, and equipment to help the project. Michel was helped in 100 ways by people he met along the way. THANK YOU! You can help again! Michel will be back HOME – arriving at Madrid–Cuatro Vientos Airport – (LECU) Thursday, 12/15/2016 at 12:30 pm local time. Please be there to welcome him home. A Spanish Hero, an explorer, a scientist, an aviator who will be recorded in history. Be there for him and for this moment in history. Congratulations to you and all your wonderful support crew world wide. I have watched all flights since my pleasure of meeting you in Mildura October 2016.
viele herzliche Grüße aus Würzburg. Superleistung!